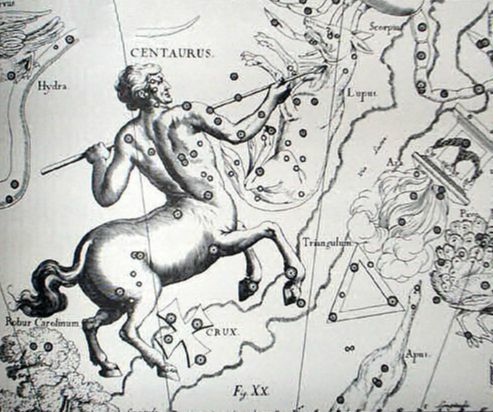 In the night sky, the constellation is the astral representation of a centaur, a mythological creature from Ancient Greece. ​In Greek mythology there was a figure called Centaurus, but it is more common to name the centaur in the night sky as either Chiron or Pholus. In Greek mythology Chiron was the immortal son of Cronus, who is famously the tutor of many famed figures, including Achilles and Asclepius. When accidentally hit by one of Heracles' poisoned arrows, Chiron would give up his immortality. Chrion though, is also associated with a second constellation, Sagitarius. There was another civilised centaur who was killed at the same time as Chiron, and this was Pholus. Pholus indeed had been the host of Heracles, when a fight between ensued between the savage centaurs and Heracles. Pholus would did when an arrowhead fell onto his hoof.